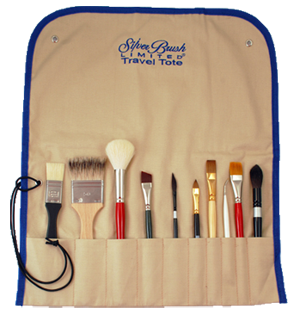 Lightweight, breathable natural canvas brush totes protect your valuable brushes while allowing them to dry. An extra long flap folds over to cover brush heads. Travel Totes™ can also roll up and tie with a strong nylon cord for traveling and storage and convenient fittings allow you to hang the tote at your workstation for easy access to brushes. *Note: Brushes are not included.